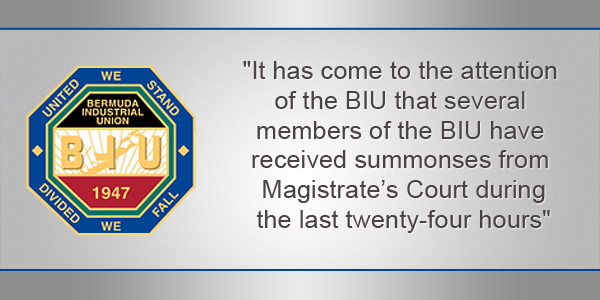 The BIU said, “It has come to the attention of the BIU that several members of the BIU have received summonses from Magistrate’s Court during the last twenty-four hours. Update 10.16am: The summonses are said to be in relation to the protest on December 2, 2016. Update 10.42am: BPSU President Jason Hayward has also been served. Update 4.50pm: Unofficial reports suggest over 10 people received summonses, with suggestions that BPSU President Jason Hayward, BIU President Chris Furbert and Rev Nicholas Tweed may be among those who have been served. *Grabs popcorn* waits and watches. This is gonna be gooooood! The BIU/PC have shown defiance to the Police. Sounds like those Communist Eastern European countries. OJ are you saying it’s OK to break the law? Are you implying that there has never been a law that was unjust or unethical? What took you so long to bring up slavery? Being a slave was at some point LAW! So get rid of all laws, I see this makes perfect sense now and this has everything to do with slavery. What is wrong with a law that stops people from obstructing MPs getting to work? Yes, there were slaves in Bermuda, but there was no law making all black people slaves. Indeed, blacks who could escape a slave ship and make it to Bermuda’s shores were free men and women. Please read about Bermuda’s history. There are many books on the subject. Here’s the law and why police were called to enforce it! We will be a country of laws and it’s about time! If the head of the union is so big and bad, let’s see him strike on his court date and not show up to court. In fact do us a favor and not show up. One more law breaker under the courts finally. I’m guessing you don’t realize that protest are meant to disrupt in order to call attention to an issue!!!! I could think of a lot better use of tax payer money than this foolishness!!!!!! Slavery was a law, Apartheid was a law and Jim Crow was a law. I CAN’T WAIT FOR THE ELECTION NOW. WONDER WHAT THE NAME CHANGE WILL BE NEXT YEAR! I guess you want free stuff again n more debt smh. More like the OJ Simpson affect! Go back home. This movie will be delayed. The Courts will only give a warning and send you back home. If not, what will they do? Lock em up? So, Let’s all keep cool heads and let this thing play it’s self out. You can use the Courts, but it does not mean that they will listen to everything you have to say. This is just a POWER PLAY. Remember that when these people are smacked with huge fines for BREAKING THE LAW ON DEC 2nd. Feel free to pay their fines Rodney. Nanny , Are you off your meds again? I do wish that you would follow doctor’s orders. Damn, that was an unimaginable display of intellect. And this is de party that you tried to get Black people to vote for? Electioneering or is it Electrickneering in progress. Last several weeks Dr.Ewart Brown and now this. A real Madagascar cartoon in the making again. Do things to help the people and not this foolishness! Wasn’t the Govt trying to get into the house to “do things to help the people on Dec. 2? Ya know, to do the job BERMUDIANS hired them to do?? You want the government to help the people, but how can they do so if they are blocked access to the House of Assembly? If you looked at a bigger picture you would see that this is all about the people. If we do not uphold our laws then we are doomed and by the way Dr. Ewart Brown did nothing for anyone but himself. Call the election Dunk please. Govern by threat, undermine and intimidate. Should go over really well at the polls. Your move, our move! I can remember who was using ‘threats and intimidation’ on Dec 2.
Who was it that was wearing the ‘Union Thug’ T shirt? So protesters go to the police to file a complaint, then get summonsed after filing. So much for See Something, Say Something. Clearly you didn’t see the same thing the rest of the island saw. IT’S ALL ON VIDEO FOR ETERNITY so feel free to check it out. Anybody can make a complaint for anything..doesn’t mean it’s justified or even reasonable.. It is all on camera! Multiple cameras, no one can escape that! Hey I could file a complaint if i get a parking ticket but if I am on camera parking illegally well guess what!? We already experienced that approach under the last two PLP Premiers. No more, thank you. I know San George I really wish the plp and the unions would not do that. Here we go again!!! Smh!! The protestors decided they were going to do what they wanted to do on Dec/2/16. The government has decided that they also are going to do what they want to do today, Mar/28. You mean the DPP has decided what they want to do today. So when did police started serving summons, what happened to baliffs? I guess its who you are. You have no idea what you’re talking about lol..stop thinking out loud..
Where does the article say that the summons were served by Police? But as an aside, the Police have always served summon’s as to do Bailiffs, or they can be sent in the post. It has nothing to do with who you are! Break the law and receive a summons. What kind of madness is this?? They blockaded parliament, its not free speech. They gave away our airport for 30 years, entitled to pay $30 Million a year for 30 years and the PEOPLE felt that they were being robbed and tried to stop it. Where were you when the plp wasted $900M on a poorly designed hospital, or when they were … our $800M? You’re such a hypocrite, OPJ…thats why everyone laughs at your posts. If you break the law that’s what’s happens. Do the crime you know the rest. The government is trash for this. This is the Department of Public Prosecutions doing this, nothing to do with the politicians. let me guess – on the return date for the first hearing of those summons’ either there will be no appearance or worse that we will have another island wide strike so that everyone can march from the BIU HQ to Magistrates court. Lets take last years unrest and make it worse!! The Government doesn’t issue summons, nor can they order the police to do so. You educate yourself. If you think the police, who have raided a civilian’s property to get support for a legal civil case abroad, is not working with the government…..
Well if there’s evidence inside that house relating to the crime, how else would it get collected?? And de police work for ……. Nothing to do with the OBA but they probably never had your vote anyway. Were they expecting nothing to happen….. Guess not… and the cycle is left to go on, and on, and on…. I wonder if they would’ve pepper sprayed elderly white folk? Do you see them blocking Parliament? They have lawyers on speed D! Because a lawyer would do you any good in this circumstance. The dumbless is dumbing me dumber here. Only those who the law work for. finish paving the roads first. Then strike. Brother Chris, threatened a strike for America’s Cup–this will likely get his feather ruffled yet again and give him a good excuse. Do you mean he has no faith in his legal team to argue that they were within the law on Dec 2? What kinda lawyers they got? A recent letter to the editor describe Bermuda as a country that has embarked on a apartheid South Africa like stance in dealing with it’s people. Now we have the police issuing summonses to those involved in the December 2 protests. I recall a police protest where police marched in uniform to protest the policies of the government with respect to their interests; a clear violation of general orders concerning the police; a protest march on parliament and as far as I know no penalties were applied to the police for those actions. the question is when is a protest a protest or is it who conducts that protest that makes it a legitimate protest? Did the Police block access to Parliament? Did they stop any one for being able to do their jobs? Did they break the law in any way while they protested? The answer is NO so there is no need to summon them to the courts. The people on Dec 2 broke the law, some in more ways then one so of course there would be summons. Don’t act as if all of the people that were there are innocent. Also it’s the courts that summons people not the police. If they’re innocent they have nothing to worry about. Just because someone wrote a letter to the editor does not make what they say true (I hope you can understand that). This is one of the problems with Bda people can say anything and there is a portion who are convinced it must be true. Don’t understand your question, a protest is a protest and breaking the law is breaking the law simple. Legitimate protests should be accompanied by liability insurance at issuence! If you want to drive moped you need at least a limited liability insurance covering you as you ride in case you case dammage or harm health or cause someone detriment to earnings or neglect of lawfull duties or responsibilities due to prevention there of doubling time and cost. Maybe some MPs need that same insurance but who would sell it them. 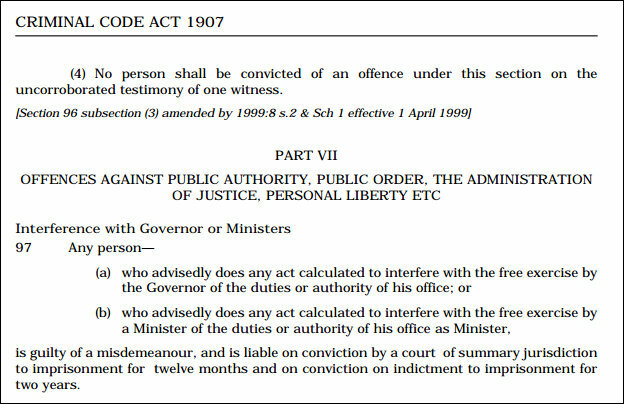 I don’t know when some of you will learn, accept or remember that the OBA Government or any Bermuda Government doesn’t have the authority to instruct the police or the courts to do anything. Onion Juice, you’re a dreamer. I do not know why people are blaming the OBA, they have no control over who the DPP places charges against. It may be easier to say everything is the governments fault but it does not make it true. The BPS made it clear that persons who broke the law on that day were subject to prosecution should the offences rise to the level determined by the DPP to be actionable. The CCTV and social media information has all been compiled and clearly there is in the view of the DPP sufficient information to proceed to court. The lawsuit against the hospital in Boston you can put to the OBA. The E Brown you cannot investigation started four years before the OBA got into power and is the sole remit of the BPS . Not troubled with people being upset just figure you should know who you need to be upset with. Nope. This is the OBA/UBP thru and thru. You are talking on the assumption that the OBA are acting ethically. They don’t even know how to do that. lol. plantation questions, they had to deceive you. How dare you use facts – that is not fair, please keep this commentary in lala land so it is a level playing field. Ya, and I have a bridge to sell you. You get a Five Star Glowstick award for the most obvious stupid comment to date on this story. The fact that you know that some people have over 200 years of history here should have been a clue. You would be better off studying the effects of the behavior you promote and how well that turned out for the people. Your racial xenophobic rant is probably the result of poor education thus limited employment opportunity supported by alternative facts. Go back to school get an education , learn a trade work and stop the infantile ranting. Nelson Mandela was a respected lawyer, Martin Luther King was an Educated Minister, both were well versed in their so called trade. If you don’t understand the point then there is no point c##t. Wow, I have a parakeet with more intelligence than you. Wow, just wow. Is it really possible to be this clueless? Yes, they want us to support the AC very much. This just cinched it. Bermuda, brace yourselves. When I heard a learned PLP MP at the last PLP airport meeting advising those in attendance not to do what they had done on December 2nd, much to their apparent disappointment, I could tell that a very serious lesson had been learned. It has been very quiet since then. My guess is that they knew the files were on the desk of the DPP and what was very likely to happen. It is a clear case, with plenty of video evidence to present as evidence. Funny, but wasn’t the protest over a “forgin” person? So go around to all of the business you are about to boycott, buy up all their bread and peanut butter first, then boycott? Makes a whole lot of sense to me LOL. Better stock up on tons of peanut butter. Hundreds of up votes in less than 2 mins of refreshing this page. One thing the BIU/PLP sure are on point when it comes to manipulating social media. If only they were so proactive and efficient when it comes to governing. Seems you need an education. Firstly,…… never mind. Have to take the unicorn for a walk. Mowhawk …..You proven it it is a fact we have aliens amongst us… i don’t recall a single situation that tried to stop anyone from protesting …you just can’t block access and deny entry by those who have a right to do so..
And who hopes to live! The OBA don’t control the police. Good, drag them off to court kicking and screaming. Onion you are a slave to your own narrowmindedness and hatred… pity really. Apartheid was legal, slavery was legal, colonialism was legal. Legality is about power not morals. …and you collect welfare from working class people….you have nothing.